1. Plaid scarf – I’ve seen street style photos where huge plaid scarfs are wrapped around the necks of stylish females for warmth and then I think how I don’t possess a plaid scarf yet especially with anything plaid or tartan on my radar. That justifies my needs, right? 2. Macaron Box – These are just as pretty as the real thing and come in an array of pastel colors. They are small enough to fit your littlest trinkets like jewelry or can function as a pill case. I wouldn’t mind keeping one on my bedside table. 3. Fresh Sugar Tinted Lip Treatment in Plum – I’ve been a fan of these lip balms since Sephora offered mini versions to Beauty Insiders as a birthday gift one year. I find them quite moisturizing and think the plum version can give me the dark lip look for winter with a quick application. 4. Alexa for Eyeko – Alexa Chung is a frequent wearer of the cat eye like myself. She relies on eyeliner from Eyeko to get her signature flick so it wasn’t surprising to me when she and the beauty brand collaborated. The kit is currently available in the U.K. and online on Eyeko’s website, but does not officially launch here in the U.S. until next month at Sephora. 5. Zara Polka Dot Dress – I saw this at a Zara last month while I was on the West Coast. I didn’t pick it up then, but still love the simplicity of it because you can’t go wrong with polka dots and a peter pan collar. Also it’s very Alexa Chung to me. 6. 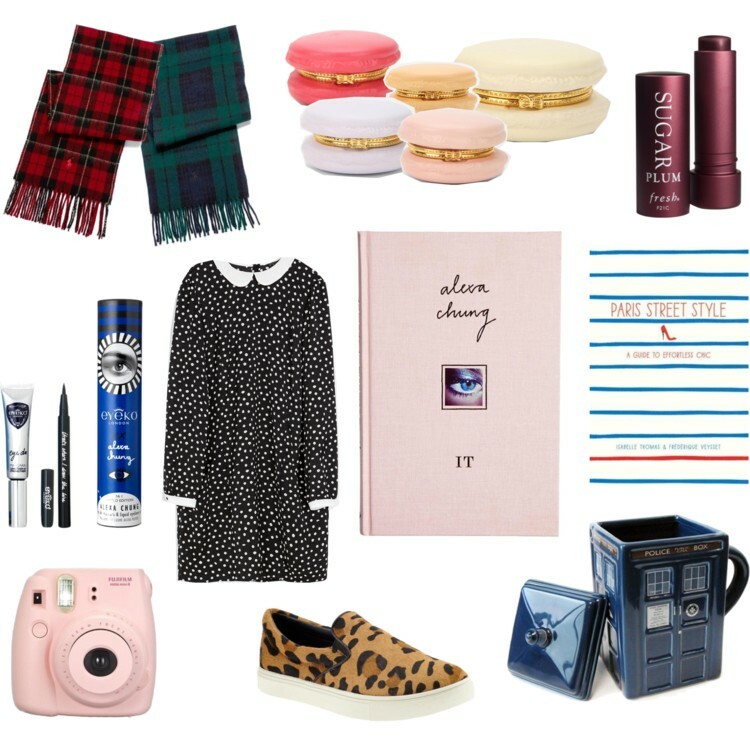 It – I’m seeing a trend here because this one also involves my favorite style icon Alexa Chung because she wrote a book and it’s an inspirational one with personal photos, doodles and notes about her life. 7. Paris Street Style: A Guide to Effortless Chic – I’ve been on the hunt for a book that debunks the style of Parisian women because they are always so poised and effortlessly chic like the title says. Other books on the subject seem to fall short when it comes to reviews, but this book so far looks like the one I need. 8. Fujifilm Instax Mini 8 Instant Camera – This camera appears to be the hot item on gift guides this year. I never had a vintage polaroid camera so I’m intrigued about getting my hands on this to capture memories that print in an instant. 9. Steve Madden Ecentric – This stylish pony hair slip on sneaker comes in my favorite animal print and is a wallet friendly version if you’re looking for something similar to its designer counterpart. 10. Doctor Who TARDIS Mug – I’m a Doctor Who fan and have been eyeing on one of these for while now because I’m pretty sure it would feel badass to drink out of this mug. Plus it looks exactly like the TARDIS!